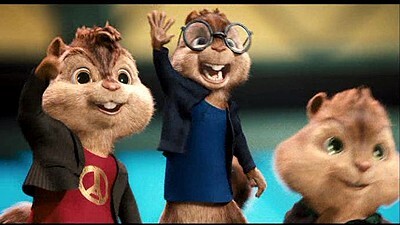 Alvin, Simon and Theodore, a trio of singing chipmunks, came into the life of David Seville in Alvin and the Chipmunks a live-action feature update on the classic characters, with three computer-animated stars blending with reality to tell the story of fame and celebrity in the music business. The first film was released on DVD in April of 2008, only to be followed quickly after that with a double-dip in November of the same year. DVDTalk has reviews of both releases. Considering what a monumental hit the first film was, it was no surprise a sequel was quick to hit theaters, and the quick turnaround is at least partially responsible for a film that's very similar to the previous movie. While it's true that history does tend to repeat itself, for it to do so here feels a touch lazy. The Chipmunks are the big stars they became at the end of the first film, and Ian Hawk (David Cross) has fallen hard after losing the group. The same goes for David Seville (Jason Lee), as he suffers a massive injury thanks to an accident caused by Alvin at a benefit concert in Paris. The first film's cast was notable mainly because of the unusual presence of two alt-comedy stars, Lee (who has a small cameo this time) and Cross (who plays about as big a role as he did before.) Sure, Justin Long, Matthew Gray Gubler and Jesse McCartney were there too (and here as well,) but with the chipmunk effect on their voices, it could have been just about anyone. Despite that, checks were written so that three big-name actresses came aboard to play the Chipettes, Amy Poehler, Christina Applegate and Anna Faris, but the same thing happens when you are made to sound like a sped-up record. Playing recognizable human roles, Levi and Wendie Malick add some comedy skills to the proceedings, but they have to compete with plenty of bodily function comedy and slapstick, which is never easy. I came here to bury the "Squeakquel," but in the end, I must praise it, simply because it wasn't made to entertain me, but the little girl who watches such movies at my side, and for her, this was Blazing Saddle combined with Moulin Rouge, a perfect blend of laughs and music. She sits enraptured as the cute, furry chipmunks make silly faces and sings along as they belt out age-inappropriate songs like Beyonce's "Single Ladies." I can't say I can find anything of value she can take from the movie, outside of a love of music, but, at the same time, there's nothing that makes me object to it either. Other than watching Cross do what he does in this movie. But I can't hold it against him. He's too funny. We received an early screener to review, so we can't comment on the retail packaging, but it seems to be a two-disc set, with a second disc for special features. The animated anamorphic widescreen menus which offer options to watch the film, select scenes, adjust languages and check out special features. Audio options include English Dolby Digital 5.1, an English Descriptive Audio Track, and Spanish and French Dolby Digital 2.0 tracks, while subtitles are available in English SDH and Spanish. Note: Fox provided a screener copy for this review. As is often the case, the screener is visually watermarked, which affects the quality of the image severely. Thus, we cannot give a proper review to the film's visual quality. Once we receive a retail copy, this information will be updated. The Dolby Digital 5.1 track offers a solid presentation of the film's audio, utilizing the side and rear speakers, to pump up the music and sound effects, most noticeably in the concert scenes, where the crowd gets fed into the satellites to put the viewer in the audience. When there's no music, it's a pretty straightforward and center-balanced, without any obvious dynamic mixing. After presenting a slim package for the first release of the previous movie, this two-disc set has a pretty nice selection of bonus content. The first disc is decent, if short, with the 'Munk Music Machine, a collection of all the musical moments from the movie, which you can watch individually, in a group or in an infinitely repeated group. Oddly, this isn't just a playlist of the original scenes, as the Chipminks and Chipettes are edited into them in addition to whatever role they played in the movie. They also frequently aren't complete scenes, as they end when the song ended in the film. But it will be entertaining to the kids who loved the movie's soundtrack. The first DVD also has a nearly nine-minute featurette about the film's musical finale, titled "Music Mania," just like the event in the movie. The focus is on both the talented performers taking part in the competition, as well as the production of the scene, including the acting, shooting and music, with interviews with the cast and crew supplementing on-set footage and clips from the movie. The thing is, it's not nearly good enough to justify putting it on the same DVD set twice, as the same piece is also found on Disc 2. Disc 1 wraps with five trailers for other Fox films. Disc 2 has a mix of featurettes and music videos, looking to entertain both older viewers and the core demographic. The featurettes is where the non-children should turn, starting with then 9:20 "Munking History," a look back at the characters' history. Long-time fans and newcomers will likely get something out of this, with the interviews with Ross Bagdasarian Jr. and Janice Karman, creative forces behind the '80s animated series, being the main draw. 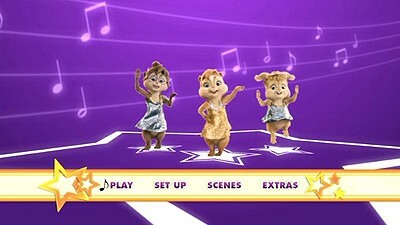 The distaff version of the trio get the spotlight in "Meet the Chipettes," an 8:36 look at the girls, with interviews with the actresses giving voice to them, as the joke about how the Chipette sound is achieved. There's more meeting to be done in "Meet the Stuffies," a 3:10 exploration of the puppets used to shoot scenes between humans and chipmunks. It's certainly amusing to see actors performing with toys. All of these elements come together in the 2:40 "A-Nut-Omy of a Scene," which shows how a short scene with Cross and the Chipettes was made. "Rockin' Rising Stars" gets more in-depth on the musical guest stars in the film, spending a bit over six minutes with Honor Society and Charice Pempengco, two up-and-coming acts. It's mostly a chance to praise them, something that should certainly done for the impressive Pempengco. Then, dancing is the topic on hand in "Shake Your Groove Thing! With Rosero" (8:59) as the film's choreographer, Rosero McCoy, shows how to perform the dance from the film's final scene. If you manage to get this dance down, with it's many fast-paced movements, you can try it out with a collection of five music videos, three of which include sing-a-long karaoke-style lyrics. Interestingly (at least to me,) the one that stood out the most, was "The Song" by German pop group Queensberry, which is the least known of the bunch, yet incredibly catchy. "The Chipmunks: Behind the Squeaking" is the longest of the featurettes, at 9:40, but it's also the most disappointing. A fake VH-1-style investigation into the Chipmunks, with the cast and crew playing along as if they are real. The joke goes on too long to really work, though Levi does a fine job playing up an obsession with the little guys. Like the last film, the only thing that really matters is how kids react, because this film certainly isn't looking to make a viewer like myself a convert. 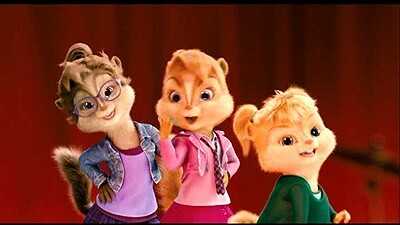 And in that matter, they've succeeded, as the musical numbers are fun and high-energy, while the chipmunks' adventures are silly enough to keep younger viewers interested between songs. The DVD quality is yet to be determined, but there's more than enough bonus material to give older viewers something to check out once the kids are bored.